Lisa Miller, a lawyer and nurse midwife, speaks to her audience at the POWER workshop about legal issues in perinatal care. Nov. 30, 2018 | Lisa Miller has a rare skill set that includes training as a lawyer and as a nurse midwife. 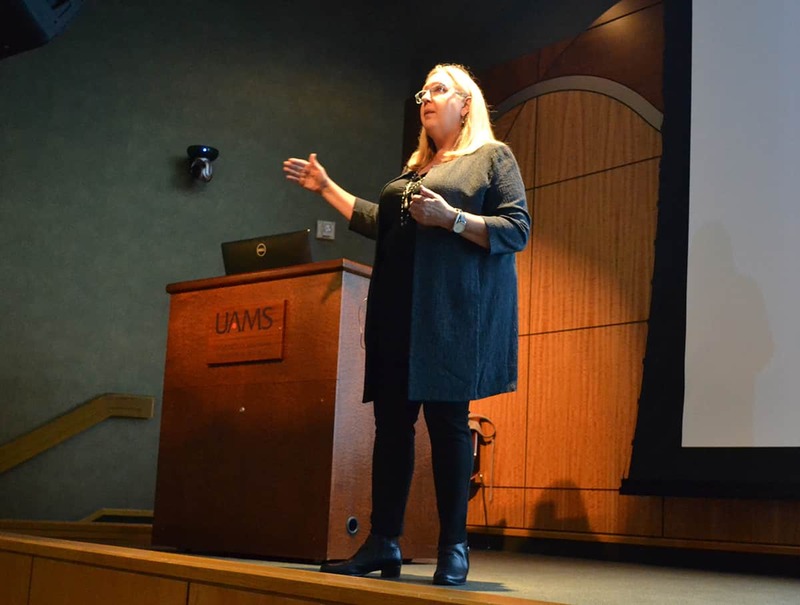 On Nov. 15 at UAMS, she put both to use with an audience of dozens of nurses and clinicians attending the POWER workshop at UAMS. 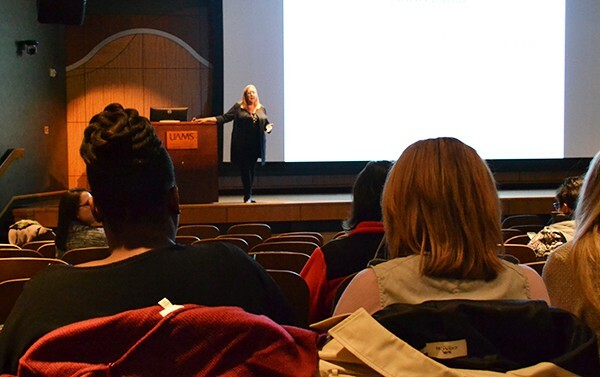 Miller offered tips to nurses in the audience on how to prepare for giving a legal deposition. The Perinatal Outcomes Workgroup through Education & Research (POWER) is an initiative of the UAMS Center for Distance Health and the 40 labor and delivery facilities across Arkansas. One focus of POWER is promoting the use of safety bundles to improve health outcomes for mothers giving birth. Safety bundles are a set of evidence-based guidelines to be adapted to local circumstances to better manage a medical condition and improve health outcomes. 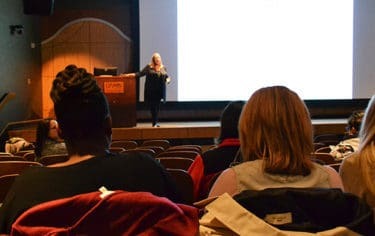 In the daylong workshop, Miller covered a wide range of related topics ranging from electronic fetal monitoring, legal issues related to Cesarean section, fetal oxygenation and the relationship between documentation and legal deposition. “The first thing to know is that liability is just a different way of being concerned about patient safety. If you want to reduce law suits and liability, then the best thing to do is reduce poor outcomes,” Miller said. One key to improving patient outcomes while reducing liability is communication. Miller said documentation of a patient’s care and treatment is meant to facilitate communication among and between caregivers, promote improved quality of care by encouraging assessment and re-evaluation, and meet professional standards. One report noted that a staff nurse spends up to 50 percent of an eight-hour shift with charting and administrative duties, Miller said. She said she once suggested the whole problem of medical record keeping and nurse charting could be solved by putting a camera in each corner of a patient’s room, equipping each nurse with a microphone and having them speak their findings into the record. Curtis Lowery, M.D., medical director of the UAMS Center for Distance Health, asked Miller during a question-and-answer session what she thought about putting cameras in operating rooms. Lowery also is chair of the UAMS Department of Obstetrics and Gynecology. Such video evidence could be used in a legal defense, to mediate a settlement, send staff for retraining when needed and to change how clinicians practice, Miller said. “Ultimately, I think more information is a good thing,” Lowery said.